Time for new Scout patterns! Here I am with one of their bags on the Vineyard that I had originally bought to tote my lunch to work. Turns out it was perfect to keep my wallet and essentials for breakfast and then throw in my beach bag later. If you aren't familiar let me acquaint you... pictured are just a few styles and patterns from the Fall/Winter and Holiday Cruise (already?!) lines. The Original Deano is one of the most popular styles, the Scout classic. I see this all over the beach in the summer since it holds so much. Another popular style. I could see this being ideal for teachers bringing supplies/books/etc. back and forth. I like that it zips shut so if it rolls over in the backseat of the car nothing will spill. 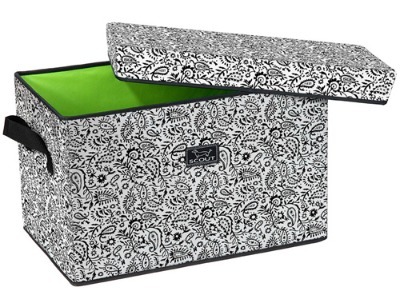 I have some smaller storage bins for winter and summer scarves. They fold up easily if needed. Perfect for short trips. I won this bag through a Junior League raffle last November. Mine is in a bright blue, which wouldn't have been my first choice but I've grown to love it and appreciate how it stands out among other luggage. It's been rolled many, many blocks in Manhattan and has held up wonderfully. 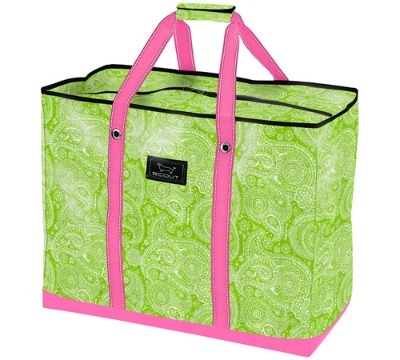 Yes, please bring me wine in one of these totes! There are also other great fall colors... but if you couldn't tell I'm partial to the paisleys. Which is your favorite pattern? I LOVE those! And where have I been?? I LOVE your new layout!!! There are some striped patterns at our local store here in Charlotte. Love the fall colors! There was a girl in the wedding I was in a couple of weeks ago and she had a different Scout bag that I had never seen before. It had a zipper top and a bunch of pockets on the outside. It was super cute! 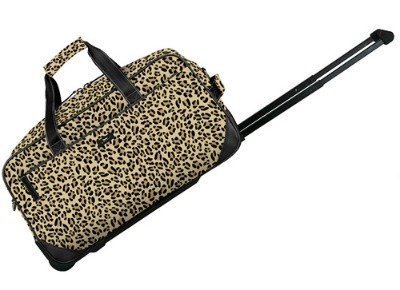 I love that rolling weekender bag -- I have a brown & tan zebra one now from a different brand that has seen better days. Time to replace with this one! This size is perfect for an airport carry-on. The first and last one won me over!!! I've been seeing Scout around.. definitely piqued my interest! And also, you look absolutely gorgeous in that picture!! Casual and crisp. 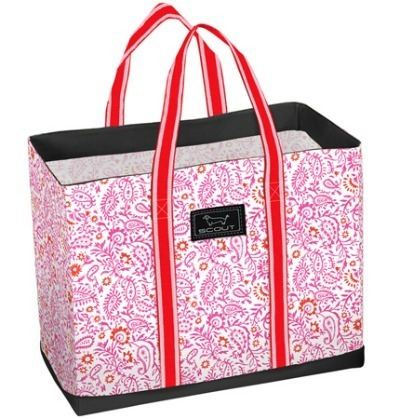 Loving the pink paisley! Definitely something I'm going to have to invest in this fall! I love the Rump Roast. I could use that now!